Ridiculed by some as a cheesy romance with a preposterous plot – the NY Times called it “the big-budget film with the highest giggle content” – and yet beloved by others as the ultimate time-traveling love story, “Somewhere in Time” does have a few things that are unassailable. There’s the beautiful Oscar-nominated score by John Barry, the fantastic costumes, and the thing that left the strongest impression on me: the magical setting of the Grand Hotel (opened 1887), which somehow lent credibility to the movie’s premise. 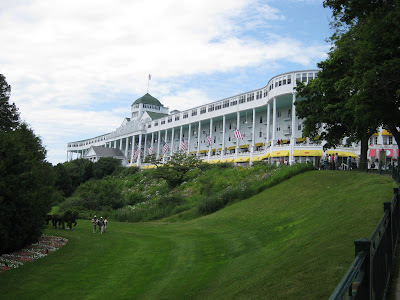 With the world’s longest porch, and a majestic position high over the water, the Grand Hotel is the world’s largest summer resort, and one of the best preserved from the 19th century heyday of refined repose. In the film, it seemed like a fantasy confection, too gargantuan and too luxurious to possibly be real. But it is real, and it’s still in operation today on historic Mackinac Island, an island off the coast of Northern Michigan in Lake Huron. 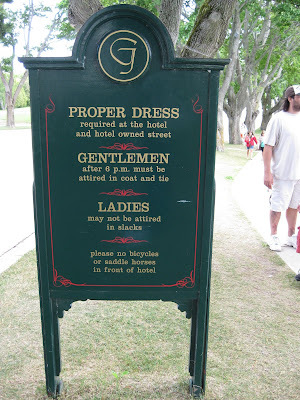 Even the gilded, aristocratic feel remains, as the “Proper Attire” requirements below demonstrate. 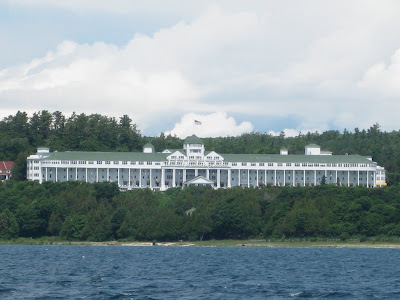 You can’t miss the Grand Hotel as you approach the island by ferry. It’s big and long and white, and the closer you get, the bigger it gets. But by the time you’re in the harbor, there’s even more to gawk at, thanks to the charming Victorian homes dotting the hillside. Helping to preserve the feeling of a past era, the first thing you notice after exiting the boat is a very interesting sound: the complete absence of car engines. That’s because the only methods of transportation allowed on the island are your own two feet, horses and bicycles. 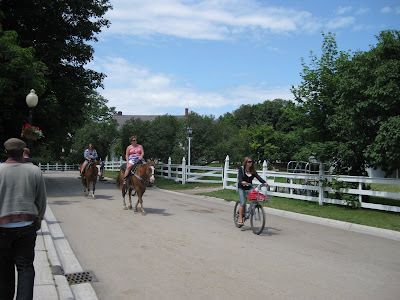 After taking in the neck-straining Grand Hotel up close (as well as an equally grand burger at the hotel’s Jockey Club), we began to wander the back roads of the island, which are really more like lanes or paths than roads. It wasn’t long before we were beckoned into what literally seemed like an enchanted forest. The trees were evenly spaced. The yellow wildflowers made a lovely blooming carpet. The sun cast beams of light in selectively beautiful spots. 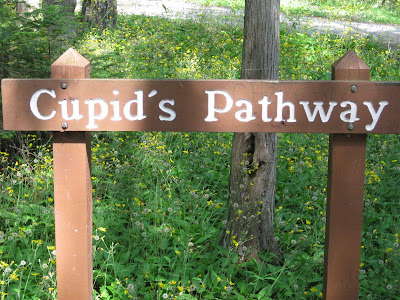 I couldn’t even roll my eyes when our little lane turned into “Cupid’s Pathway.” It really was the spot to fall in love. Carefree and semi-lost, we passed a beautiful old cemetery and eventually climbed some stairs to an old fort at the highest point in the island. After our walk in the woods, we made our way back to the tourist congestion in town. Admittedly, it was a Sunday in July, which is the peak of the island's "season" (May-October). Canadians. Americans. Foreigners. You name it, they were all here, and like us, they seemed to be trying to decide on the best place for fudge. Why fudge? 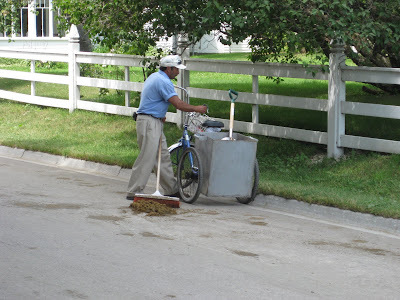 All I can tell you is that for over a century, Mackinac Island has been known for its legendary fudge. The trend apparently started when an island resident got tired of the maple candy exported from Canada and decided to make his own treat. Finding a fudge shop is not hard. 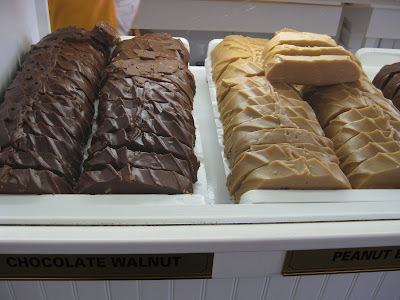 There are at least six main fudge franchises (including Murdick’s, Ryba’s and May’s), and each has several storefronts. So no matter where you are in town, you’re likely less than two doors from a fudge purveyor. It’s choosing the fudge shop that’s so hard. They all have different recipes and flavors. Some are more traditional in their offerings – chocolate, vanilla, peanut butter, etc. Others have gotten pretty creative, offering flavors like Traverse City Black Cherry and Amaretto Chocolate Chip. Yet like a cartel as tight as OPEC, they all charge the same price – around $7/slice, or three for $16.95. After several taste tests as well as observing the fudge-making process (it’s made daily in the stores on big marble tables), we settled on Joann’s Fudge. The main reason was that there were dark chocolate options offered among the 30 flavors. Most of the other shops only had milk chocolate fudge, which was much sweeter. We ordered the divine Double Dark Cherry Pecan for ourselves as well as several gift “slabs” to take home. We felt complete as fudge-eating trolls now. With the pressure off, we headed to Mary’s Bistro for a drink on the waterfront deck before catching the ferry back to modernity. 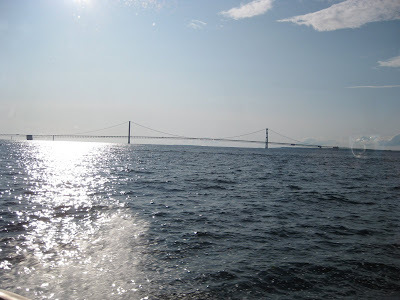 Above is a parting shot of the view of the Mackinac Bridge (connecting the Lower Peninsula and Upper Peninsula of Michigan) from the boat. 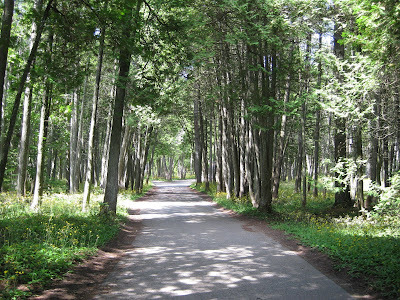 I live on Mackinac year round, and I've got to tell you I can't imagine living anywhere else! 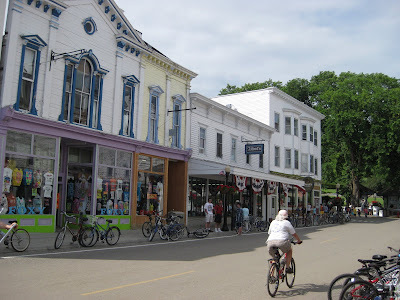 If you'd like living close to the natural world and feel the rhythm of the changing seasons in your daily life then Mackinac would be a good place for you.